The New International Version Bible says Psalm 139:13 this way... For you created my inmost being; you knit me together in my mother’s womb. The New Living Translation says... You made all the delicate, inner parts of my body and knit me together in my mother’s womb. No matter what translation you prefer, this is a gentle picture of God's loving creation process. You were not blasted into creation, but gently formed in your mother's womb by a loving God who took the time to delicately knit all your inward parts together. May the revelation of your creation bring a sense of well being to your soul. You were not a mistake. God planned you before the foundation of the world and He determined the exact time of your birth. One of the greatest tragedies in this world today is the feeling that our lives were a mistake. Some people were even told that by their parents. The truth is that no life was ever a mistake. Each person ever created, was created with intention by the One who is love itself. 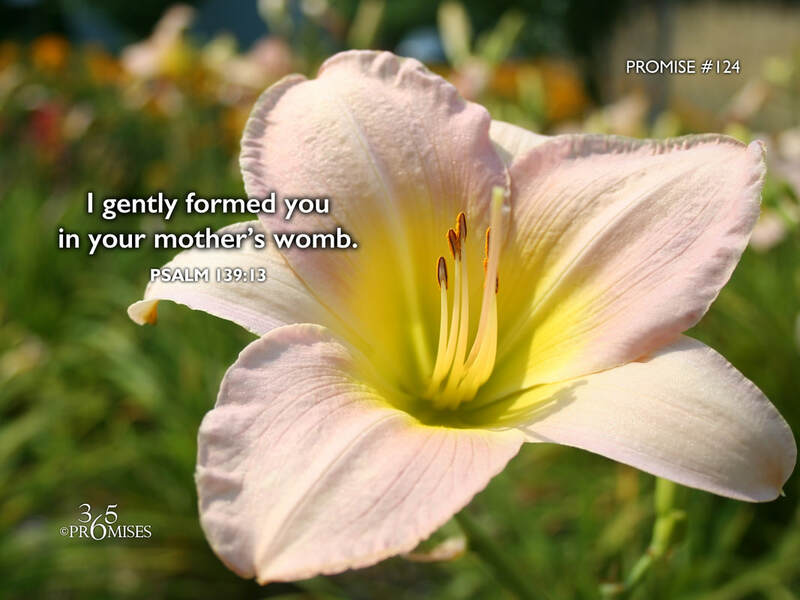 God gently formed you in your mother's womb and He is the One who brought you forth on the day you were born. (Psalm 71:6) There is absolutely no doubt about it!